The term hearth and home takes on new meaning when designing a fireplace. Gas fireplaces provide heat, light and beauty. Vented and vent-free logs are both used in a gas fireplace, but they act very differently. 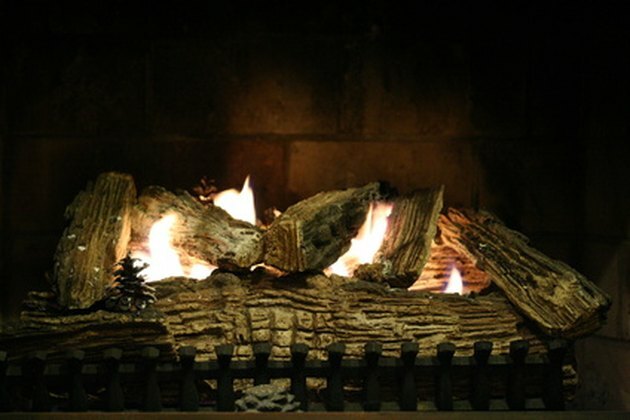 Vented logs create a large, realistic fire with dancing flames. This type of fire requires a chimney for safety. Vent-free logs do not need a chimney, but provide a smaller flame. These logs are designed to hold the heat and reflect it into the room. Gas fireplaces use realistic-looking concrete logs to simulate a wood fire. Inspect the logs. All vent-free logs are firmly attached to a U-shaped burner and cannot be moved. If the concrete logs are loose, the logs are designed for vented use. Follow the gas line from beneath the logs to where it disappears in the wall or floor. If the gas is merely contained by a simple gas line, then the logs are vent free. If there is a small cylinder attached to the gas line, then the logs are vent-free. This is called the Oxygen Depletion Sensor and is located just outside the range of the fire. It measures the oxygen in the area. Federal law mandates that all vent-free logs be equipped with an Oxygen Depletion Sensor. When the oxygen level drops, the sensor turns off the gas and stops the fire. Turn on the fireplace. If the flames reach above the gas logs and the look like a wood burning fireplace, then the logs must be vented. If the flames are small, an have a blue cast, the fireplace is vent-free. Based in Nashville, Shellie Braeuner has been writing articles since 1986 on topics including child rearing, entertainment, politics and home improvement. Her work has appeared in "The Tennessean" and "Borderlines" as well as a book from Simon & Schuster. Braeuner holds a Master of Education in developmental counseling from Vanderbilt University. Is There a Damper for a Gas Fireplace? How do I Troubleshoot a Comfort Glow LP Heater? Can a Propane Fireplace Cause Carbon Monoxide?